Part-time Avenging Angel, Sometimes Assassin, Full-time Friend. Witness to her brother’s murder, Michelle is dead set on revenge. But how? Neither a gangster or a cop, she’s just a regular person, an “everywoman.” Now, she’s also hunted and homeless. Her life in shambles, and mad as hell, Michelle discovers the hero living in the heart of each of us. She uncovers the strength we know we’d have if faced with the same life destroying disasters. Lacking skills, street savvy, and information, but full of determination, she sets out to exact the revenge the killers so richly deserve. 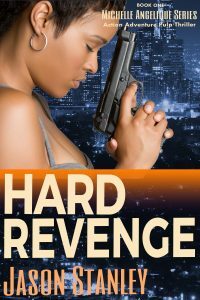 Powerful women all, Michelle and her two lifelong friends buck the odds of street crime, life in the hood, dirty cops, and crappy boyfriends. The system is stacked against them. Steeped in messages of distrust, failure, and being lesser, can these friends succeed where generations of others have fallen prey to the easier way out?